Being the supreme geeks we are, one of the great bonuses to moving to Hamilton was the prospect of being only 40 mins away from Hobbiton, the amazing little piece of New Zealand farmland out in the middle of nowhere transformed (twice!) into a magical film set for two epic trilogies. The set is beautiful, surrounded by lush green hills about 12 ks from Matamata, literally in the middle of nowhere. But for me, it is the stories told as part of the two hour tour that are really intriguing. 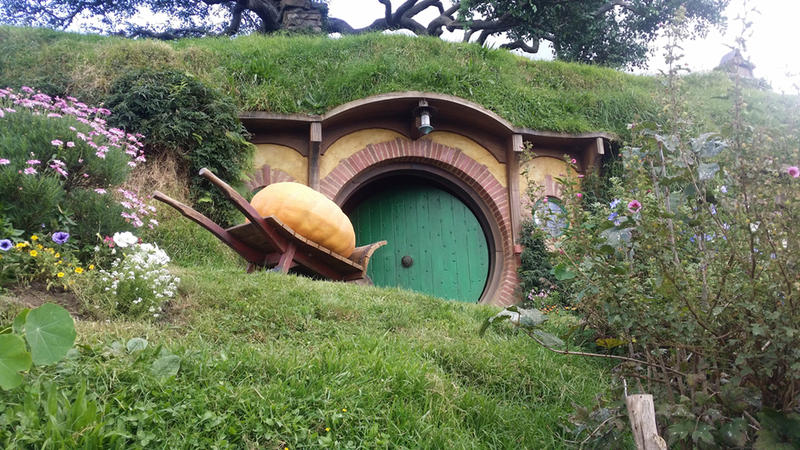 For instance, every hobbit hole is built to a predetermined scale so that they could achieve what they in the movie business call ‘forced perspective’. The hobbit hole below was a smaller scaled model, with the top lintel only reaching to your shoulders. An adult standing in front would look like a giant – or a normal human in a hobbit world. 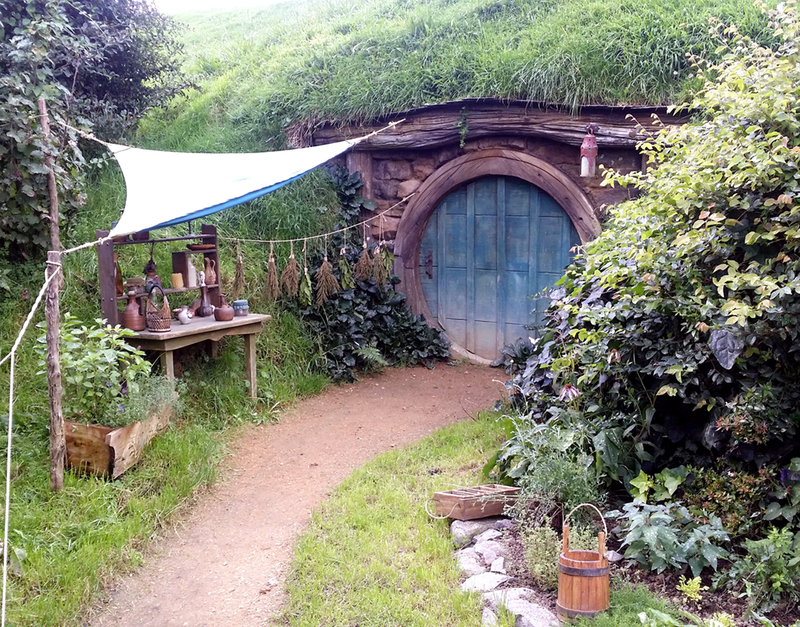 The larger hobbit holes were for filming the hobbits in front of so they appeared child-like. Sadly, any interior shots were done in a studio so there was no climbing in to see what Bilbo’s house at Bag End really looked like inside. But there was no denying the exterior views were pretty special. The New Zealand Army actually had a lot to do with the creation of the original set. Peter Jackson was still an up-and-comer and the budget was tight. Legend has it he approached the NZ government for assistance and they volunteered the Army to lend a hand, building a road into the site (still used today) and digging out sections of the hills to install the facades. It was arguably the worst-kept secret ever that filming of LOTR was happening in the area, especially when the army dudes knocked off for the week, went into the local Matamata pub, got drunk and spilled the beans. Fortunately, Kiwis are very similar to Aussies with their blase attitude and didn’t get in the way. By far the best story of all revolves around the large oak tree atop Bag End. Do the leaves look a bit funny to you? They should – they’re fake. They have done a marvelous job of making it look so realistic but it was a long and difficult process for some poor sap (yes, pun definitely intended!). 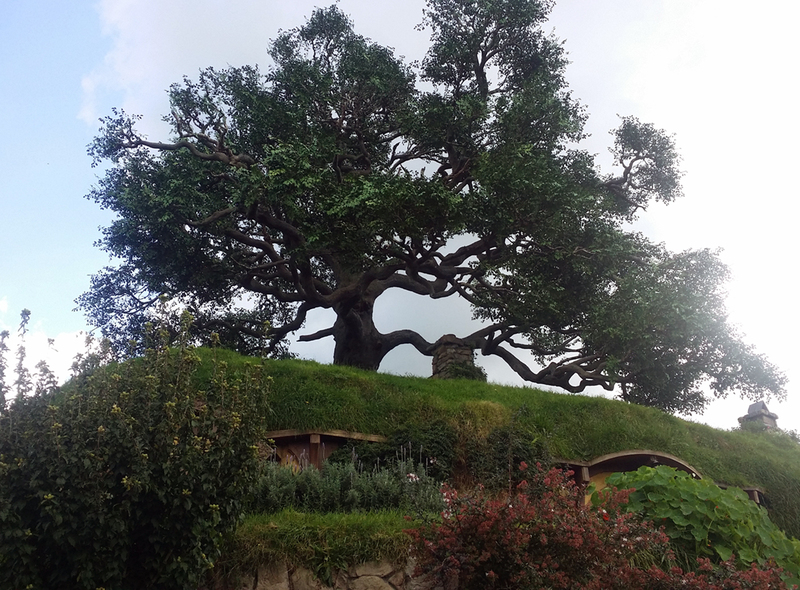 If you’ve read LOTR and The Hobbit you know the tree is an important part of Bag End and whilst they could have done CGI, Peter Jackson was quite adamant about using realism as much as possible. They first scoured the area for a suitable oak tree: found one near Matamata; carefully carved it into a giant jigsaw of branches; numbered them; trucked them all back to the set and reassembled the tree. Of course, trees aren’t much for moving so … the leaves fell off. So they arranged for something like 30,000 silken oak leaves from Taiwan to be delivered and some poor sucker had to manually attach them with wire to the tree. Dear sweet lord. But then … it took a while to get around to actually filming on the exterior set and thanks to the New Zealand weather, the leaves had all faded. What to do? Spraypaint. Every. Single. One. I bet someone was muttering swear words under their breath while they did it. After LOTR filming wrapped up, they took away a fair percentage of the set, including the oak tree. In 2011, when they decided to film The Hobbit, they had to go through the whole process again! But this time, the set would stay. The owners of the property signed a contract that gave them permission to keep the set intact after filming and use it to conduct tours. The first tour was apparently six people taken in a jeep – nowadays they have 55 seater buses going three-four times a day, every day apart from Christmas. 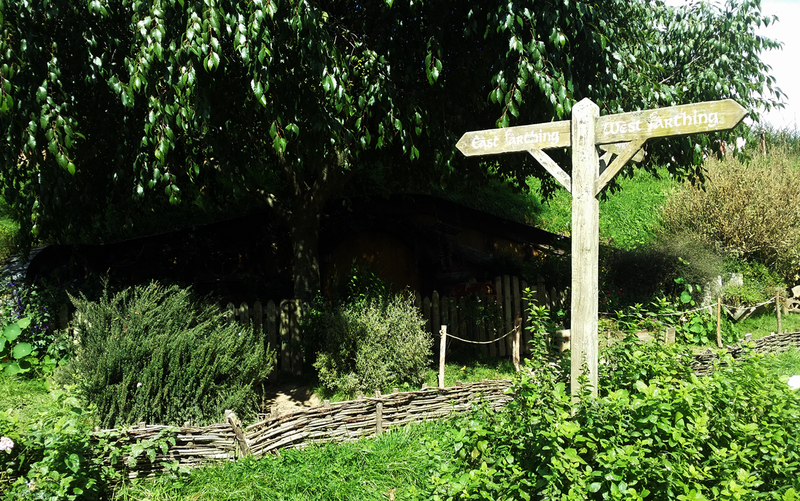 If you ever get a chance, take a tour through Hobbiton. It’s not just the beauty of the set but stories of the sheer determination and ingenuity of people passionate about creating something amazing that will inspire you. An open face. A tired and troubled soul. His ability to make us laugh will be sorely missed. 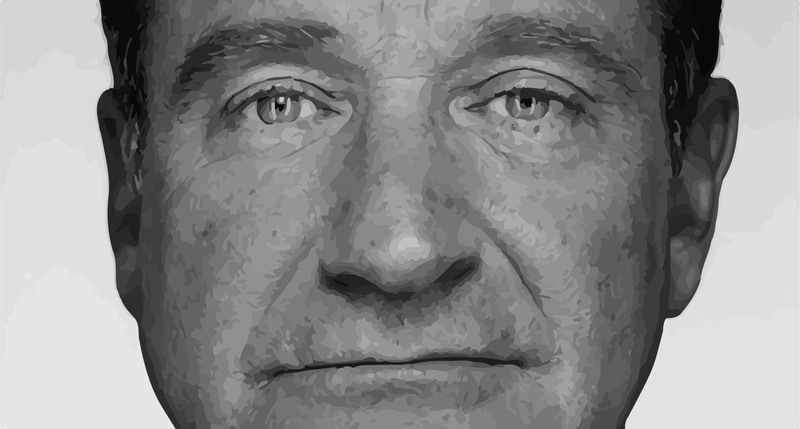 Everyone who hasn’t been living under a rock (or on a hilltop in remote Iraq avoiding being slaughtered … but that’s another blog entirely) has heard the sad news of Robin Williams’ passing. I really didn’t want to get on that bandwagon – I don’t know him personally, I’ve never met him, I have no real rights to grieve his death – and yet … it haunts me. Robin Williams reminded me so much of my dad – who also died at age 63. My dad looked similar, his laugh was just as loud and instantly recognisable and he also hid a struggle with depression and disease behind the jokes and sociable outward face he presented to the world. See, the thing with depression is you never fully recover from it. It’s always looming in the background, ready to tap you on the shoulder when life’s hurdles start making you jump. A little bit of stress and all of a sudden, there you are. In the bathroom. Trying to put your makeup on to get to work on time whilst sobbing for no apparent reason. You know what the reason is, though. And you learn to adopt practices to try and sidestep that gaping black hole both terrifying and tempting. You know it will actually pass, if you can just make it through the morning. The day. This week. Dad used to give himself 24 hours. He was allowed to wallow at the bottom of the hole for a day and then it was time to resume the mad scrabble up the sides to reach the light. Life for me has become so much better since my dark hole days, but every now and then depression gives me a little tweak, just to let me know it’s waiting for me should I ever drop my guard. But back in the days when it wasn’t so great, those days when I would wake to a crying jag, I knew I’d have trouble dragging myself to work but once there, the people I worked with would lift my spirits just by being themselves and by lunchtime, the light would be breaking through the thunderclouds. I used to promise myself to concentrate on the fun jobs that I enjoyed and the crappy stuff could wait a day. (I was the boss, which was handy.) I was gentle and kind to my soul, making no demands and forgiving transgressions (“You want that cupcake? Have at it. You can exercise it off tomorrow”). I tried to go for a walk in the sunshine, or in summer tried to do a few laps at the pool. Or just settled for a bath. Anything that would soothe and re-balance the chemicals in my brain causing me to feel funky. Did Robin have little rituals and promises he made to himself? I’ll bet he did. But the recently revealed fact he was in the early stages of Parkinson’s Disease must have been just too much. No amount of rituals or promises would spare him from traveling that path. I hope he knows that he took a piece of the world’s heart with him when he died.